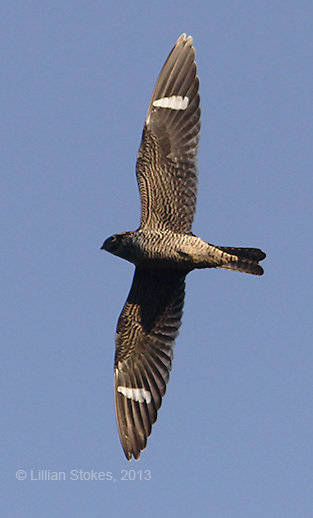 Common Nighthawk, male. Males have a white throat, white subterminal primary bar on wings and a white band on the tail. 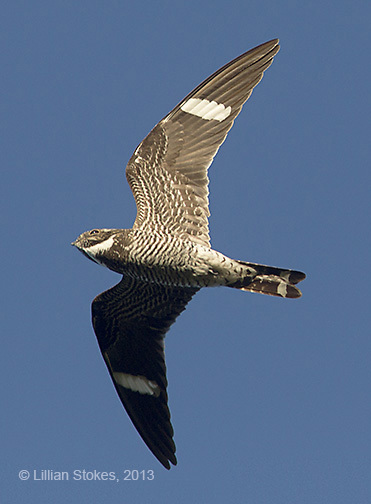 Common Nighthawk, female. Females have a buffy throat, smaller white primary bar and no tail band. 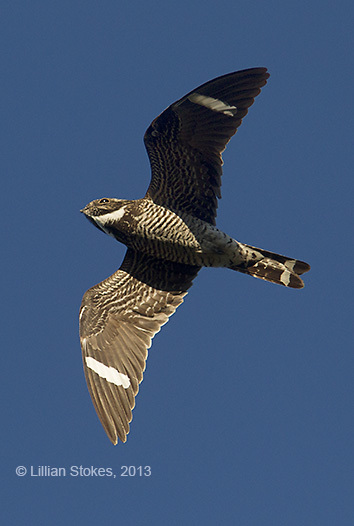 We were so fortunate on Aug. 24th to witness historic Common Nighthawk migration here, from the deck of our house in NH and saw 2,202 birds in one night. We have gotten good flights before, but last night blew away our previous high count (1,058 in one night.) We live on a dammed-up section of a river, where the river flows north and nighthawks often follow river valleys on migration. We count from our deck and were joined Sat. night by our friends, Phil and Julie Brown and Henry Walters. Of the 2,202 birds we saw, 1,772 were flying north, 430 flew south, which is not unusual for this site. Presumably they follow the river and eventually go south. Common Nighthawk numbers have been declining in the Northeast so it was very exciting so see so many of them that night. 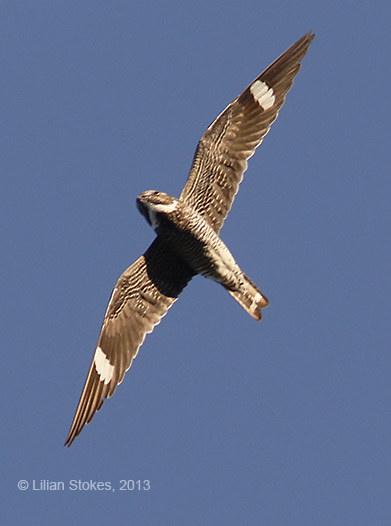 As you may recall Common Nighthawk is the 2013 American Birding Association's Bird of the Year and they have a cool multimedia art contest you can enter and win prizes. 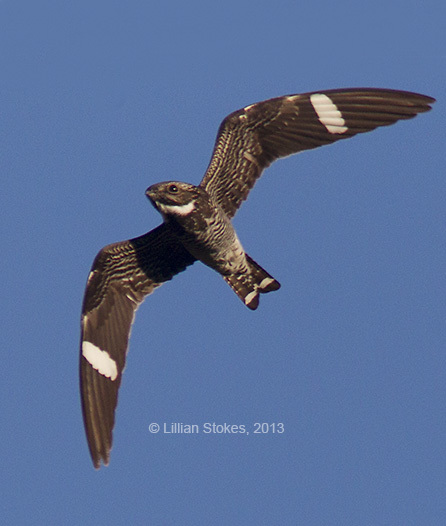 Common Nighthawks are strange birds that feed at dusk and scoop up flying insects in their large mouths. They nest across much of the country, on gravelly soil in fields, or even gravel rooftops in cities. One of the best times to see them is during migration, which is winding down now but you still may see some. 1. Look during the later afternoon to early evening hours, from about 4 pm to 7:30 pm. 2. Look north, as they generally move from north to south. 3. Get comfortable, use a chair if you can, you will be looking for quite a while. Tuck your elbows in, it is less tiring and steadier to hold binos that way. 5. Note if there is an ant hatch. Nighthawks are attracted to, and eat, dispersing ants who rise up in clouds. 6. 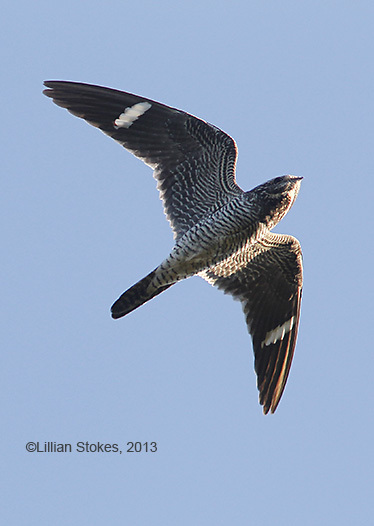 Study the photos above, to learn nighthawk shape. Often you will only see distant birds with long pointed wings, flapping rather slowly. When feeding, nighthawks fly erratically. When migrating, they move more directly and may even rise up on a thermal sometimes. Photos were taken with my Canon 1D Mark IV and the 300mm lens plus 1.4 teleconverter. Photographing them is a challenge, but fun. Seeing the spectacle of these wonderful birds in such numbers was even more fun and just one of those magic moments in birding that you cherish. To me these are truly strange birds! A great effort on all counts. Getting to see them, see them in numbers and capture them so well with your camera! great to see them and fun to share. You managed to photograph them amazingly well considering the difficulty. A wonderful experience to see so many especially since they are declining. The markings underneath are quite amazing! I've never seen one. I love these birds and I would have loved to see that sight! Wish you all could have seen them!